Last month I attended the 29th Annual Workshop of the Psychology of Programming Interest Group. to present a work-in-progress paper on the methods we are using on the CONVER-SE project. PPIG 2018 was hosted at the Art Workers’ Guild in Bloomsbury, and we were lucky to have members of the guild taking an active role in the event by presenting talks, taking part in activities, and displaying art work in response to some of the topics of the conference. 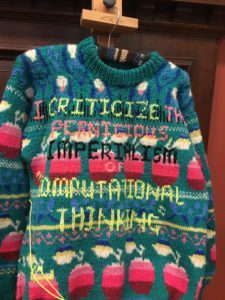 My favourite artefact on display was this ‘Computational Thinking’ knitwear, customised by Rachael Matthews. There was a great range of talks, and a good mix of new work from PhD students and early career researchers to well-established world-leading researchers. Unfortunately the gender mix was not so good, and I was really surprised to be one of only three female academics presenting across the two and a half days. It’s not something organisers have a huge amount of control over, but perhaps the line-up of invited speakers and keynotes could have been considered more carefully in this regard. Still, the PPIG community were welcoming and friendly as always, and I had some great discussions over the course of the event, and useful feedback on my talk. My highlights from the academic work presented were Andrea diSessa and Alan Blackwell’s talks. Andy diSessa spoke about the role of programming in learning science and mathematics, and the design and use of the highly influential Boxer language. I was particularly interested in his discussion of the development of the ‘tick’ model as a conceptually simple but powerful approach for novice programmers, that has many potential applications. He also argued that computational literacy could be a more helpful approach (than computational thinking) in addressing how computers might powerfully change learning in STEM. Alan Blackwell, whose extensive research on end-user programming has been a great inspiration for the CONVER-SE project, spoke about programming language research as a craft practice. He highlighted how programming itself can be considered a reflective craft and gave examples of how attention investment can be supported through smooth transitions in programming by demonstration and programming by example approaches. His talk also prompted me to look back at Steve Tanimoto’s ‘liveness levels’ and consider more carefully how this applies in end-user programming in the home.